Happy Hispanic family purchase a new home. You’ve found your dream home. Now let’s go get it! Buying a home should be exciting, not stressful. 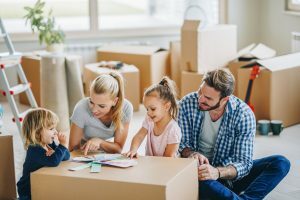 Whether you’re buying a new home or refinancing your current one, our friendly home loan experts make the process fast and easy so you can enjoy it. Choose from a variety of terms and interest rate options to get the payment that works best for you. A fixed rate mortgage gives you the stability and security of knowing just what to expect each month on your mortgage. Knowing that your payment will not change lets you budget your monthly expenses accurately. The terms range anywhere from 10 to 30 years, whatever is best for your budget. This type of loan will give you the opportunity to finance residential and investment housing. Jumbo loans are also available. An adjustable rate mortgage enables you to branch out into different ventures. The rates are always kept competitive to keep your payment down to a minimum. This type of loan will give you the opportunity to finance commercial properties, residential and investment housing. Some loans are available with terms up to 30 years. Sometimes the mortgage payment that you started with no longer fits your budget. If your financial circumstances have changed and you need to change your monthly payment amount, or you just want to take advantage of a lower rate being offered today, you may be able to refinance your mortgage and save money. All Cumberland Security Bank mortgage professionals are registered on the Nationwide Mortgage Licensing System & Registry (NMLS), which promotes uniformity and transparency throughout the residential real estate industry. The NMLS Consumer Access is a free service for consumers to confirm that the mortgage company or mortgage professional with whom they wish to conduct business is authorized to conduct mortgage business in their state. Each mortgage professional will be identified by their individual NMLS number which is provided below.